There is no such thing as black titanium. The black colours produced on our black titanium rings, bangles and pendants are either a form of oxidation which is the process we use, or an industrial process called physical vapour deposition (PVD). We use the colour black to add contrast to the natural grey colour of titanium or as a dramatic background to the bright colours in our Petals collection for instance. To produce intricate designs on our black titanium rings, we use a laser engraving machine which produces a very accurate black finish that is very hard wearing and perfectly suitable for wedding rings. Use the product filters on this page to see our collection of black titanium wedding rings. 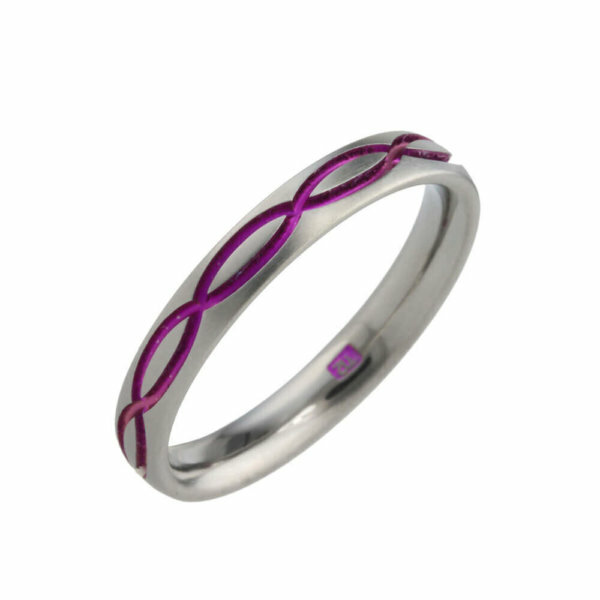 All titanium rings shown on this page are available in other colours too! Click the images to see more details and the colour options available.